We’d sooner leave the house without pants than leave our handbag behind. How do we keep this vital outfit element well-stocked for busy days? Cash: It sounds obvious but we’re not just talking about a fistful of plastic you typically rely on to buy what you need. Keep a twenty dollar bill tucked away in your bag (not in your wallet!) and you’ll be prepared for emergencies—like getting your wallet nabbed. Beauty Supplies: By the end of the day, some of us need a touch-up. Carry concealer to cover up any surprise spots, a tube of mascara and the instant, outfit-making pop of color for your lips. One Small Accessory: Stow away a pair of fabulous earrings for when you need your day look to become evening-ready. You’ll also be glad to borrow an earring back should you lose a back of the pair you’re wearing. Drug Store Necessities: Keep a small zippered pouch stocked with practical necessities of aspirin, hair ties, feminine products, nail files and a stain removal stick (we’re pretty sure Murphy’s Law refers to wearing white denim). Hunger-Banishing Snack – A pouch of almonds or a granola bar comes in handy when stuck in a traffic jam and seriously debating pulling into that drive- thru. Another trick we like to employ, especially to cut down on rushed mornings is to have everything by the door so you can grab and go. Have your phone charging by the door, your keys on a rack and those easy to loose bobby pins in a small bowl. You’re all set! 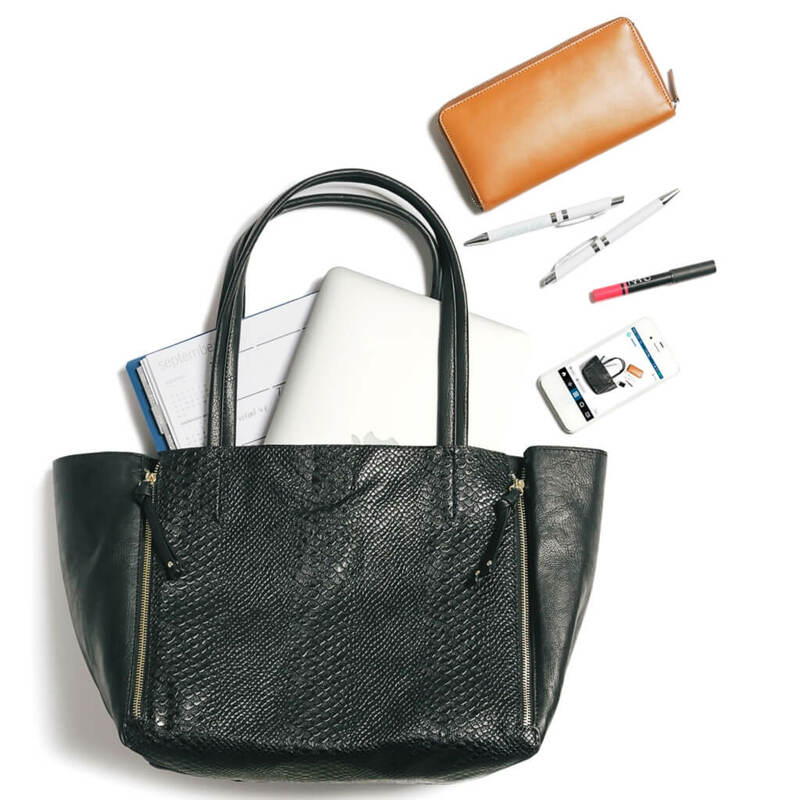 What do you always carry in your handbag? Tell us in the comments below!